The title of this really rings true, as this device works for ALL of my charging needs. 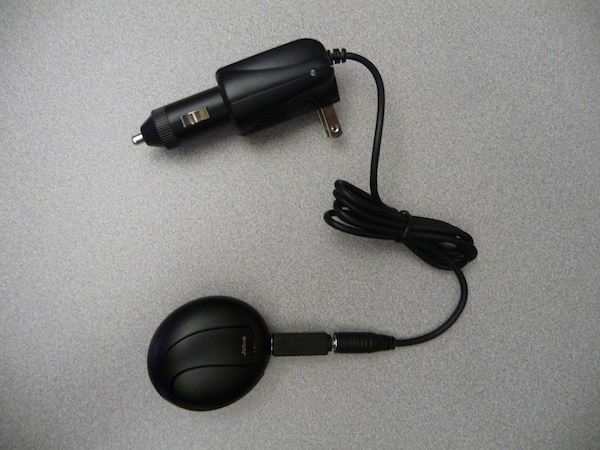 The company, Gomadic, makes charging adapters but they do it with a twist. Instead of making a different cable for each device, they use what they call "Tip Exchange" so that you only have to buy one cable and the initial charging tip. Once you accumulate devices, instead of buying all new cables, just buy the tip you need and you are good to go. The cables are made by Gomadic and have a lifetime warranty on them (For the first thirty days after your purchase we replace or refund all Gomadic products no questions asked. After the thirty-day grace period has expired, we ask our customers to provide a brief explanation of the problem and if there is indeed some product defect, we're happy to replace any Gomadic product for as long as you own it.) as well as a high output of 1000mAh. On top of that, according to Gomadic, they use "advanced internal circuitry to protect from power surges, overcharging and short-circuiting." 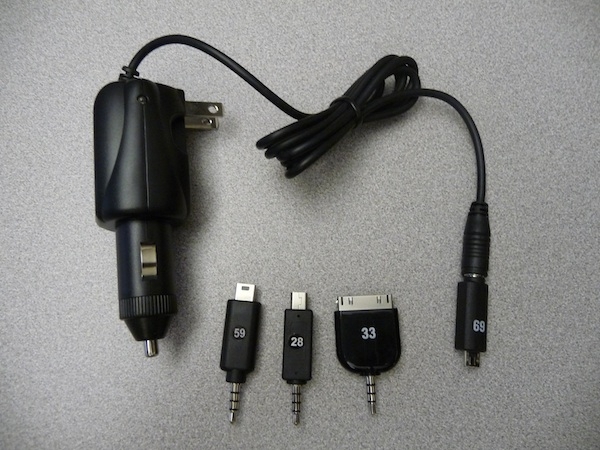 These chargers are also built to work anywhere in the world with their international adapter kit. In the photo above, I have the iPhone Car and Home 2 in 1 Charger but for the tip, I'm using the microUSB (number 69) so I can charge my Jabra Bluetooth headset. Now I decide I need to charge my iPhone 3GS so it is as easy as taking off tip 69 and putting on the iPhone tip (number 33). This Tip Exchange process they came up with really is slick. And as far as cost, it is very reasonable. 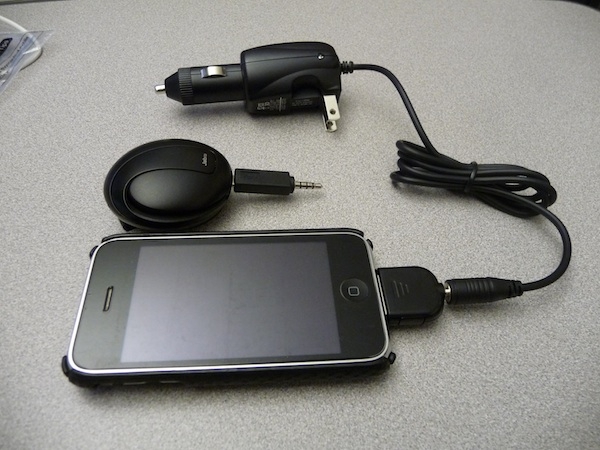 The charging unit above is $27.95 USD and comes with the iPhone charging tip. As I did a little research on their site, I found most of the cables were in the range of $17.95 USD to $34.95 USD, so very reasonable and not out of line for what you would pay for a device specific charging cable. The higher priced ones were also dual type chargers, giving you the ability to charge in your car or from a wall connection. They even have a charging station that comes with four tips for home use that is only $49.95 USD. Once you have the charger and you decide you want to add a device, just go to the Tip Exchange section of their website and input your device details. For example, I checked on a tip for an HTC Droid Eris (no, I did not buy one, just used it as an example), and using the Tip Finder, it turns out it uses tip number 21. This particular tip sells for $5.95 USD. Sure beats buying a new cable for 20 or 30 dollars! The need I was trying to fill was one cable for everything, hoping that I would only have to carry around one cable and a few tips and it would replace the eight cables that I currently use to do the job. And the need was filled! This dual capability charger works on all the devices that I carry on a regular basis, so no more jumbled mess of cables for this reviewer. Such a simple solution to a problem we have all experienced at some point in our technology-filled lives. Jeff Campbell is a fan of all things Apple, an X-boxer (the 360 kind) and geek. He works as a floor supervisor in a 911 center in the Portland, OR area, and lives in a small town just north of Mt. Hood with his wife, two kids, two dogs, a snake and a tarantula. Oh, and a three legged cat named "Tres."